This was an outstanding display of power and pace from the team that earlier in the week had won the team-of-the-season award at the annual youth dinner and awards night at the Rugby Club. With seven tries in the first half and five in the second, the result was never in doubt, however the visitors never gave up and scored a deserved try late in the match. All the Reds’ players made a strong contribution – the pack showing real power and direct running, exemplified by Jamie T’s try in the first half when, seemingly stopped on the 22 after a fine run, he broke out of 4 tackles to power away for a fine try. The backs were lightning quick to exploit opportunities, with stand-off Struan pulling the strings and firing out exquisite passes to launch his outside backs. 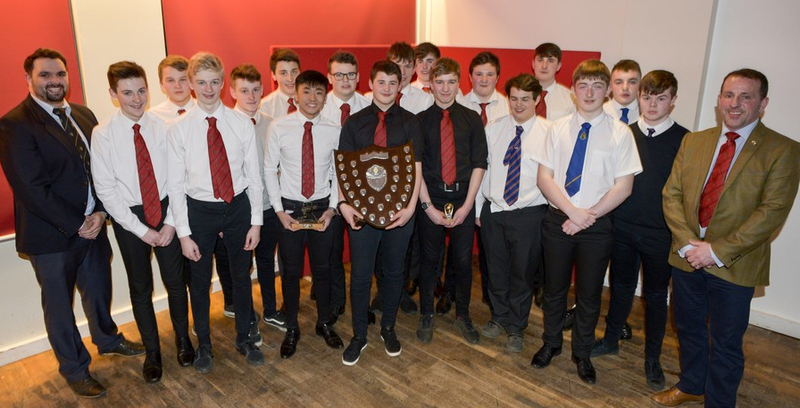 The core of Saturday’s team are pictured below receiving the team-of-the-year award at the annual Youth Dinner and Awards on Wednesday 22 March 2018.